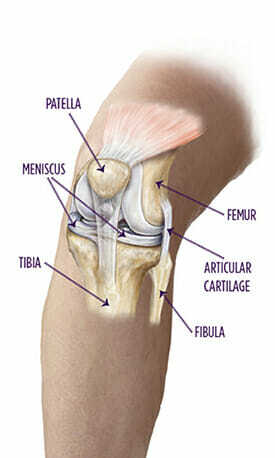 Tears of the meniscus, a rubbery, C-shaped disc that cushions your knee, are a common knee injury. Each knee has two menisci (plural of meniscus), one at the outer edge of the knee and one at the inner edge. With proper diagnosis, treatment, and rehabilitation, you’ll often be able to return to your pre-injury abilities. A meniscus tear is usually caused by twisting or turning quickly, often with the foot planted while the knee is bent. These tears can occur when you lift something heavy or play sports. As you get older, degenerative changes of the knee may contribute to a torn meniscus. How are meniscal tears diagnosed? Often, a torn meniscus can be identified during a physical exam. Your doctor may manipulate your knee and leg bones into different positions to help pinpoint the cause of your signs and symptoms. X-rays are typically done to assess for arthritis or bony injuries, and an MRI is done to confirm injury to the meniscus. How is a torn meniscus treated nonsurgically? What are the surgical treatment options for a torn meniscus? If nonsurgical treatments are not successful, your doctor may recommend knee arthroscopy. Arthroscopy is a minimally invasive operation in which the surgeon examines the joint with an arthroscope, a pencil-thin device equipped with a camera lens and light, and trim out or repair tears in the meniscus through a small incision. Decision to repair or trim out tears is based on the type of tear, location of the tear, quality of the tissue, and patient factors. Some repair techniques require another incision to aid in the repair. After surgery, your doctor may put your knee in a brace to keep it from moving while healing. Our knees buffer us as we pursue the activities of day-to-day life. Over time, wear and tear can take a toll on knee function. We review common knee symptoms, and explain the potential causes for each problem.